Under the teachings and encouragement of Greg Walsh and Nikki Cousins I began to deepen my knowledge and practice, practising both Iyengar and Ashtanga yoga I developed a practice that suited my body and mind. I found my way to Vinyasa through the great teachings of Rohan Hennessy and Elena Moreo who have both taught me extensively. 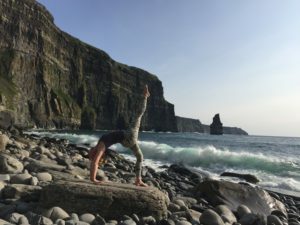 I have been practising with Rohan for the last seven years and I find that Vinyasa resonates deeply with me. 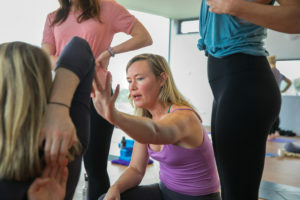 Through the 300 hours of advanced teacher training in the Elbow room I have trained with movement practitioners Gary Carter, Susan Church and Yin practitioner Josh Summers. I love the effect Yin yoga has on my body and mind and it has become a deep part of my daily practice. I currently practice and teach Vinyasa, Yin and Restorative yoga. I believe through the practice of yoga we can find balance, clarity and stillness of the mind. For more information on Dearbhla please see her website.